Take pumpkin pie a step further with this Turtle Pumpkin Pie recipe. 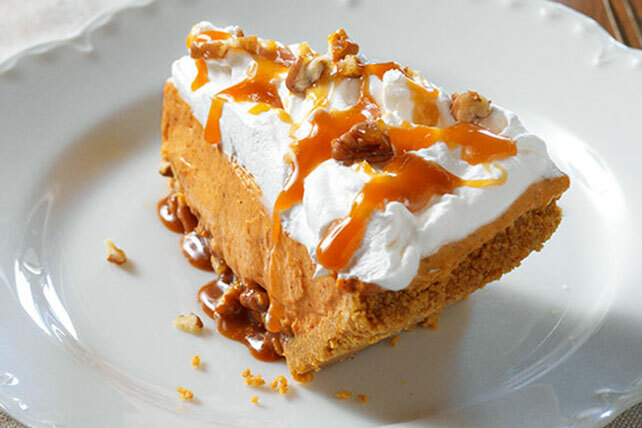 Airy COOL WHIP, drizzled caramel and chopped pecans top this Turtle Pumpkin Pie. Beat next 5 ingredients in large bowl with whisk until blended. Stir in 1-1/2 cups COOL WHIP; spoon into crust. Refrigerate 1 hour. Top with remaining COOL WHIP, caramel topping and nuts just before serving. At 10 servings, this tasty pie is the perfect dessert to feed a crowd. Microwave 16 KRAFT Caramels and 1 Tbsp. water in microwaveable bowl on HIGH 1-1/2 min. or until caramels are completely melted, stirring every 30 sec. Use instead of the caramel ice cream topping. Need some ideas for how to use the leftover canned pumpkin? Go to kraftfoods.com and search for "pumpkin." Carefully transfer pie crust from pie pan to a colorful pie plate or festive plate before using to prepare pie as directed.